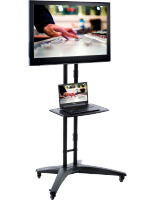 This flat panel TV stand on wheels is designed to provide users with everything necessary for a successful advertising campaign or presentation. 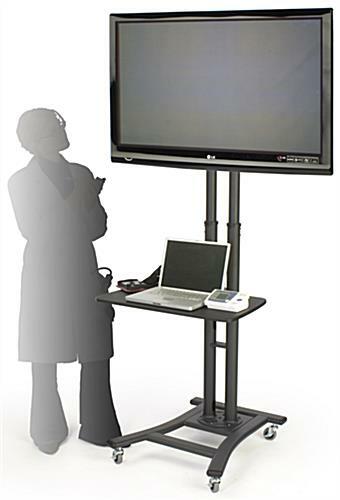 The AV cart is able to function highly in retail, trade show, office, and medical establishments. This LCD TV stand for businesses features four locking wheels at the base for fast transport to different advertising areas. The casters have locks for stabilizing the position in heavily trafficked situations. 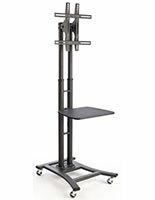 This LCD TV stand on wheels, similar to monitor racks, adjust in height from 44"-71.5" to hold the screen in the best position. The AV cart tilts a total of 15° to meet the appropriate viewing angle. 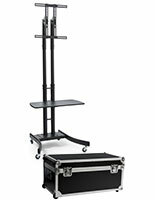 This flat panel TV stand on wheels uses VESA compatible bracketing for easy mounting with most television screens. 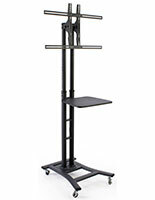 The monitor rack includes a 28" equipment shelf for devices or accessories. This wide-screen TV stand has an aluminum metal construction to ensure longevity. Users can rest assured that the freestanding AV cart will stand tall in busy venues. 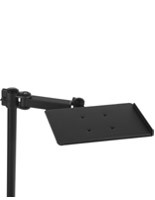 This LCD TV stand comes completely knocked down for lower price points. 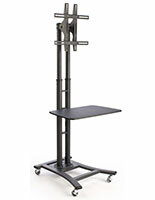 The monitor rack includes an instruction manual and hardware for speedy assembly and installation (in some rare instances, users may need a slightly different screw, but this hardware is available at most hardware shops). 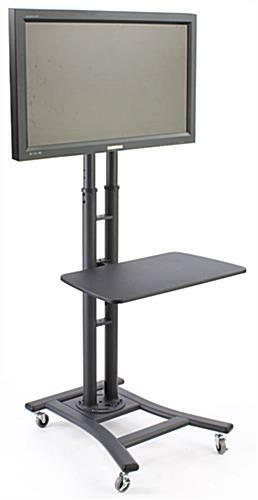 This type of portable TV stand has started to become a mainstay in hospitals and other medical arenas for viewing different results. 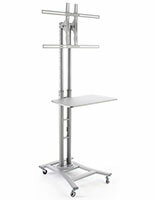 The shelving unit easily serves as a user work-station for taking notes. This TV stand has a black exterior for a neutral coloring that blends in with most areas. The VESA-compatible mounting bracket is designed to support 37" to 65" monitors (LCD, LED, OLED, plasma) in landscape orientation.